The drive chain slack should be checked before each ride and adjusted if necessary. Place the motorcycle on the sidestand. When checking and adjusting the drive chain slack, there should be no weight on the motorcycle. Shift the transmission into the neutral position. Move the rear wheel by pushing the motorcycle to locate the tightest portion of the drive chain, and then measure the drive chain slack as shown. If the drive chain slack is incorrect, adjust it as follows. Loosen the axle nut and the locknut on each side of the swingarm. To tighten the drive chain, turn the drive chain slack adjusting bolt on each side of the swingarm in direction (a). 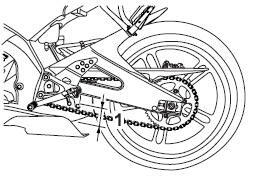 To loosen the drive chain, turn the adjusting bolt on each side of the swingarm in direction (b), and then push the rear wheel forward. NOTICE: Improper drive chain slack will overload the engine as well as other vital parts of the motorcycle and can lead to chain slippage or breakage. To prevent this from occurring, keep the drive chain slack within the specified limits. Using the alignment marks on each side of the swingarm, make sure that both drive chain pullers are in the same position for proper wheel alignment. Tighten the axle nut, then the locknuts to their specified torques.